WAILUKU — Bishop Wickes is a valuable runner for the Baldwin High School football team, but Saturday night his receiving prowess propelled the Bears to their biggest win of the season. 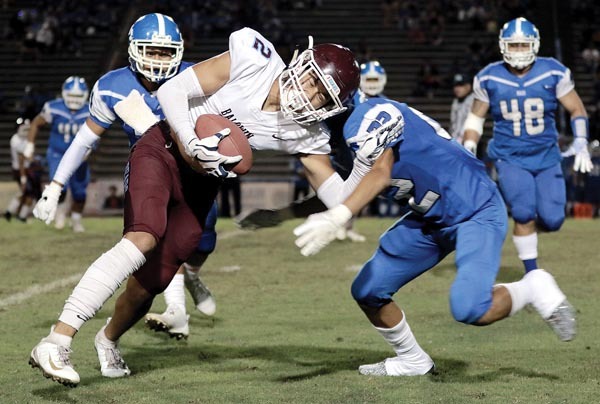 Wickes hauled in a screen pass from La’a Asuega-Stark and rumbled through traffic 15 yards to the end zone to give Baldwin a 10-point lead in a 24-14 victory over Maui High at War Memorial Stadium. The victory earned Baldwin (3-5) the Maui Interscholastic League Division I second-round crown and forces a playoff game involving the Sabers (4-3) and Bears on Nov. 2 at War Memorial Stadium. The league has a pair of makeup games slated for next week as the result of postponements from Hurricane Lane in August. 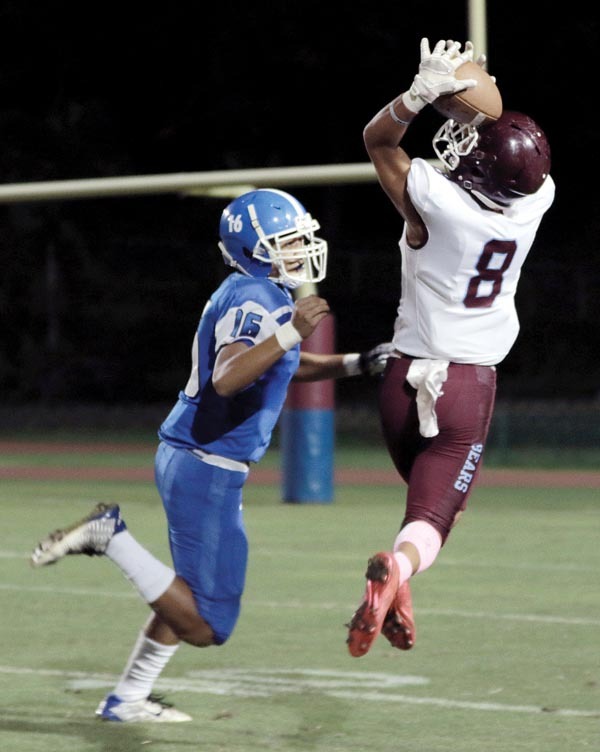 Maui High is scheduled to play Kamehameha Maui next Friday in a game originally slated for Aug. 24. The Bears are idle next week. Saturday’s win reversed a 44-6 win for Maui High in the first meeting between the two largest schools Maui County on Sept. 15. Wickes did rush for 131 yards and a touchdown to push him into second on the MIL rushing list, but it was his third catch of the night that was the key. The Bears slammed the door shut on the Sabers when linebacker Chasen Foster intercepted a Brex Delray pass with 2:24 to play. The Bears took the lead for the third time when Kili Madrid caught a 32-yard touchdown pass from Asuega-Stark with 7:15 left in the third quarter. The acrobatic play capped a four-play, 67-yard drive that started with a 40-yard fly sweep run by Maluhia Plunkett. The Sabers led 14-10 at halftime in a back-and-forth first two quarters. Wickes put the Bears ahead early when his 25-yard field goal capped a nine-play drive on the opening possession of the game. Midway through the second quarter, Wickes broke free up the middle on a 75-yard touchdown run to give the Bears a 10-7 lead. After Wickes’ field goal, the Sabers needed just one play and 12 seconds off the clock to take a 7-3 lead when Nakamoto rumbled 65 yards untouched to the end zone. Nakamoto’s 3-yard touchdown run with 31 seconds to go in the first half gave the Sabers the lead back after a nine-play, 55-yard drive. Nakamoto ran five times on the drive for 42 yards. Nakamoto finished 126 yards rushing and now has 1,162 for the season. Maui High coach James Kammerer declined comment after the game. B–FG Bishop Wickes 25, 7:51. MH–Naia Nakamoto 65 run (Brex Delray kick), 7:39. B–Wickes 75 run (Isaiah Souza kick), 5:36. MH–Nakamoto 3 run (Delray kick), 0:31. B–Kili Madrid 32 pass from Laa Asuega-Stark (Souza kick), 7:15. B–Wickes 15 pass from Asuega-Stark (Souza kick), 7:33. KK–FG Hanalei Akina 26, 9:01. 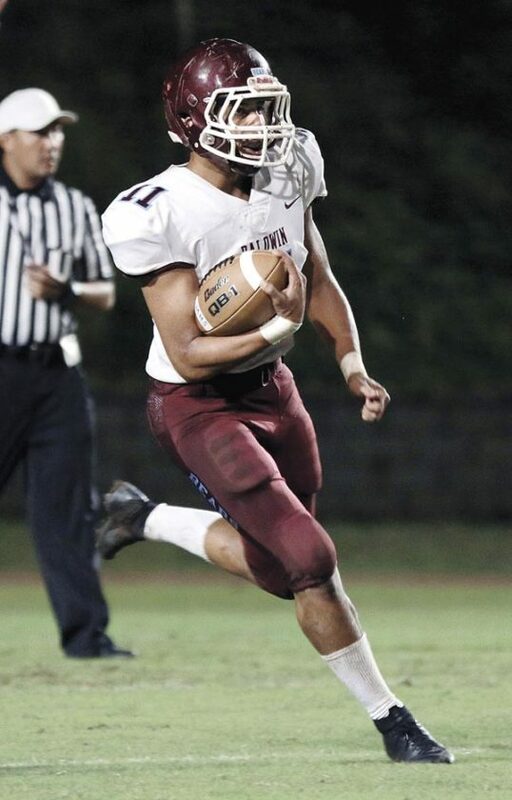 RUSHING–King Kekaulike, Hunter 28-198, Kali Kuhaulua 3-14, Zack Hokoana 3-14, Kris Barlahan 1-(minus 1); Kamehameha Maui, Abarra 14-236, Catan 5-70, Adams 4-50, Noah Helm 2-19, Hamasaki 1-0, team 1-(minus 9). PASSING–King Kekaulike, Hunter 1-10-0–11; Kamehameha Maui, Adams 14-22-0–217, Hamasaki 1-1-0–12, Catan 0-1-0–0. RECEIVING–King Kekaulike, T.J. Perkett 1-11; Kamehameha Maui, Pupunu 5-95, Smith-Kemfort 5-74, Hamasaki 2-34, Ah Yat 2-26, Abarra 1-0.